New Delhi, April 15: The enforcement agencies till now have seized cash, drugs, liquor, among others worth Rs 2,500 crore with the second phase of Lok Sabha elections on the way. The value of goods seized till now is already double of what was seized in 2014 elections. According to a report published in NDTV, enforcement agencies are confiscating around Rs 100 crore in cash and goods every day. The agencies are raiding railway stations, airports, highways, hotels and farmhouses if there's any suspicion of any illegal activities. Accepting the money to cast vote or not to vote is a punishable offence with prison and fine or both. In 2014, the Election Commission of India (ECI) seized Rs 1,200 crore worth cash and other goods. 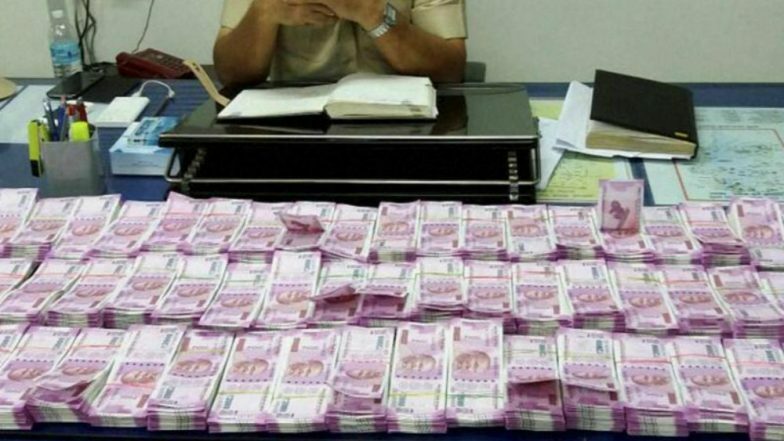 Income Tax Department Seizes Rs 14 Crore Cash from PSK Engineering in Chennai. "It is becoming a menace and assuming alarming proportions -- it is a national malady. It also shows how people are placing more faith on money than policies and programs," said V.S. Sampath, former chief election commissioner (CEC), to NDTV. Till April 12, in Tamil Nadu itself, the EC had seized unaccounted cash, gold and other valuable items worth Rs 552.23 crore since the Model Code of Conduct (MCC) came into effect last month. Rs 129.51 crores in cash, gold and silver worth Rs 422.72 crore were seized, said Chief Electoral Officer Satyabrata Sahoo.